Destinations across the world are beginning to replace or supplement culture-led development strategies with creative development. This book critically analyzes the impact and effectiveness of creative strategies in tourism development and charts the emergence of 'creative tourism'. Why has ‘creativity’ become such an important aspect of development strategies and of tourism development in particular? Why is this happening now, apparently simultaneously, in so many destinations across the globe? What is the difference between cultural tourism and creative tourism? These are among the important questions this book answers. 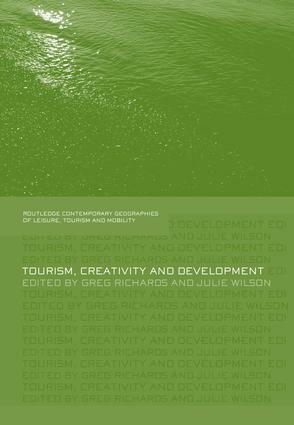 It critically examines the developing relationship between tourism and creativity, the articulation of the ‘creative turn’ in tourism, and the impact this has on theoretical perspectives and practical approaches to tourism development. A wide range of examples from Europe, North America, Asia, Australia and Africa explore the interface between tourism and creativity including: creative spaces and places such as cultural and creative clusters and ethnic precincts; the role of the creative industries and entrepreneurs in the creation of experiences; creativity and rural areas; the 'creative class' and tourism; lifestyle, creativity and tourism and marketing creative tourism destinations. The relationship between individual and collective forms of creativity and the widely differing forms of modern tourism are also discussed. In the concluding section of the book the contribution of creativity to tourism and to development strategies in general is assessed, and areas for future research are outlined. The diverse multidisciplinary contributions link theory and practice, and demonstrate the strengths and weaknesses of creativity as a tourism development strategy and marketing tool. It is the first exploration of the relationship between tourism and creativity and its consequences for tourism development in different parts of the world. Tourism development trajectories: From culture to creativity? Tourism quality labels: An incentive for the sustainable development of creative clusters as tourist attractions?